High protein nut & seed flatbread, naturally rich in fibre, slowly dehydrated below 45 °C. High protein nut & seed flatbread with such a „bread-like“ taste for all bread lovers. 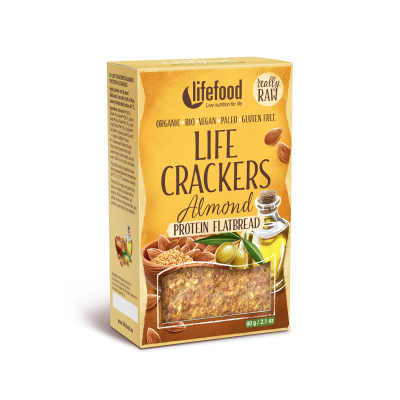 It is made with flax seeds, almonds, and caraway and has a soft texture. 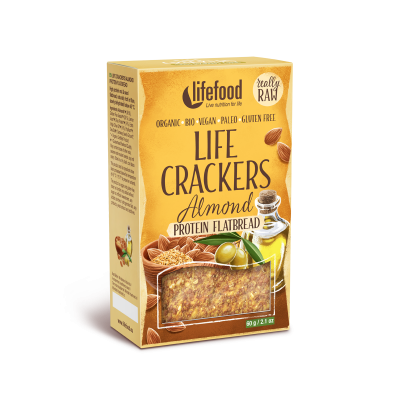 Lifefood flatbread is perfect on its own, with salads, for sandwiches or as a base for your favourite spreads. Almonds* (38 %), Golden Flax Seeds* (33 %), Lemon Juice*, Rice Protein Powder* (9 %), Extra Virgin Olive Oil* (9 %), Psyllium*, Sea Salt, Caraway Seeds*. May contain traces of other nuts, sesame and mustard seeds, soy and celery.